Since coming back to George Town we have fallen into the “George Town” way of life. What does that mean? Well, we do the regular chores of grocery shopping, laundry and fueling up and filling up on water regularly usually before lunch. 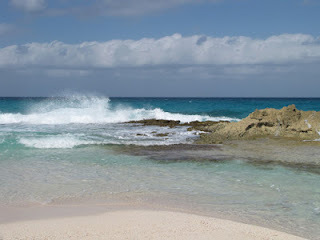 Other mornings are spent doing yoga, walks on the various paths on Stocking Island, and walks on the beach. Crashing waves on the sound side. 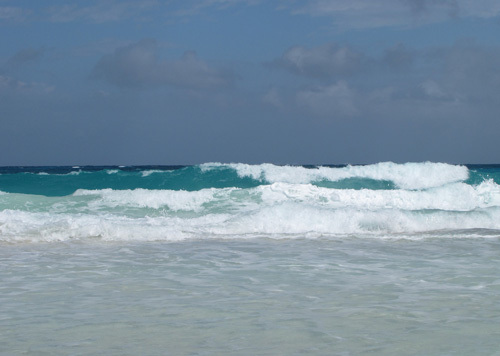 and the beautiful waves flowing in with such contrast of colors. 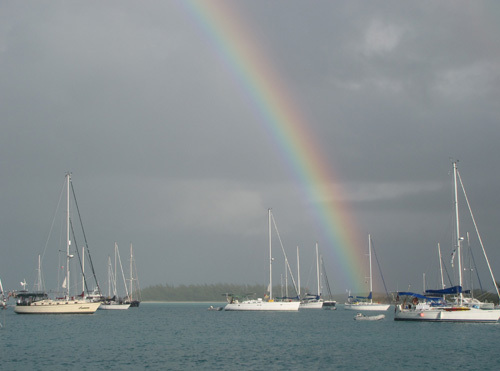 Another natural treasure was when we were treated to a beautiful rainbow after a light sprinkle with the sun out. 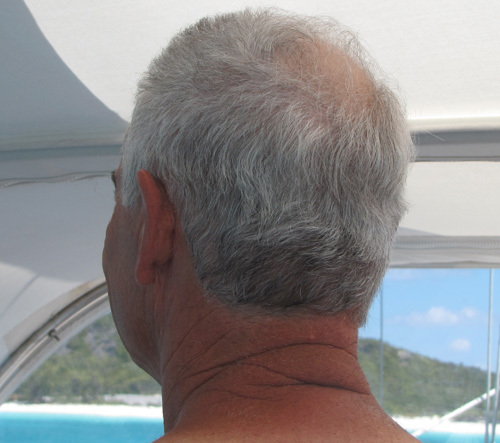 Another morning we got rid of Al’s curls when I gave him a ½” buzz cut. Some mornings are spent on maintenance such as cleaning the floats in the holding tank. (I am glad Al did that while I was at yoga! 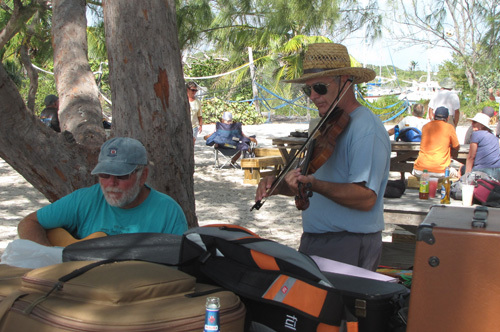 Enjoying guitarist and fiddler on Volleyball beach. Afternoons are often spent on Volleyball Beach although neither Al nor I do volleyball. We enjoy the entertainment if people are jamming on the beach with their instruments and singing. 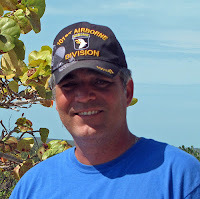 I enjoying making baskets or teaching a new cruiser how to get started making a basket. Then there is always someone with whom you can find to just talk. They think big for their beacxh fires! Late afternoons we often get together on our or another boat for happy hour, sometime playing games, other times just for great conversation and sharing information. 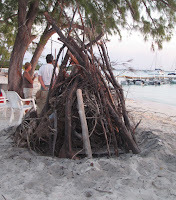 Twice a week there is a gathering at Big D’s on Hamburger beach for a jam session and bonfire. 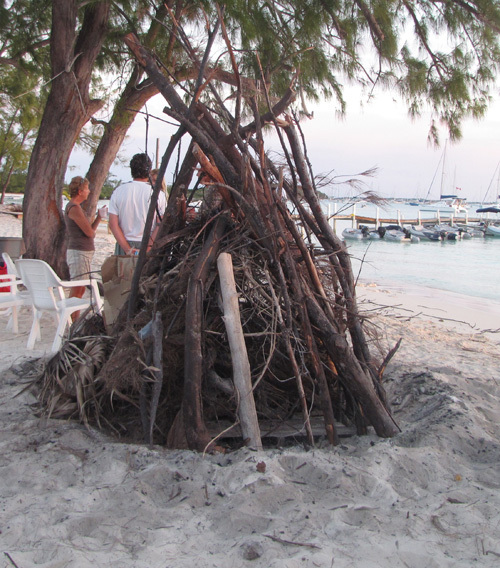 This past week we were treated to another pretty sunset while there and you can see how they set up for the bonfire. Jewelery made from hamburger and heart bean. Evenings are spent mostly reading for Al and rug hooking or doing jewelery for me. 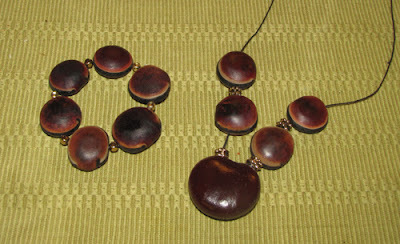 Here is a necklace and bracelet made from a heart bean and hamburger beans found on the beaches. 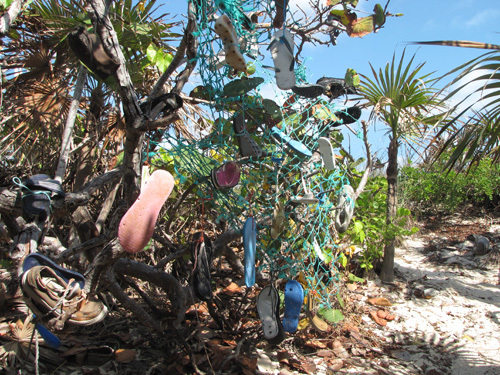 They are pods that come in from Africa and other countries that end up on the beaches. 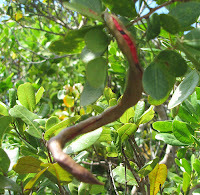 I found most of these down in the Ragged Islands. Al and I volunteered to work the tee-shirt booth in town one morning for the sale of regatta tee-shirts and other regatta items. It was right after several days of strong winds when many people could not get over to town. That resulted in having the best day of sales they had this year with over $800 worth sold in 2 hours. 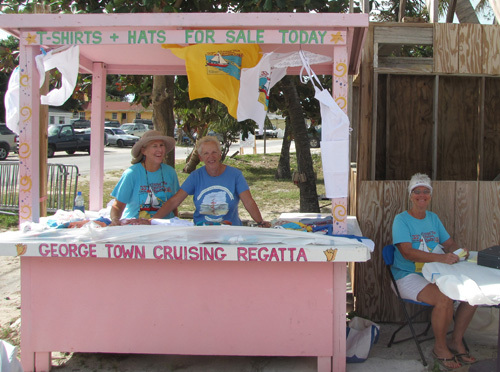 Regatta starts soon and so we will be even busier with activities to participate or just watch and be entertained. We finally had to take a day and do some chores. As Al spent the morning hauling water to fill the water tanks, I went grocery shopping and to the new meat market that is about 4-5 miles out of town. They come in a pick-up truck and take you out and when everyone is done, they take you back. The meats and fresh salads are wonderful. 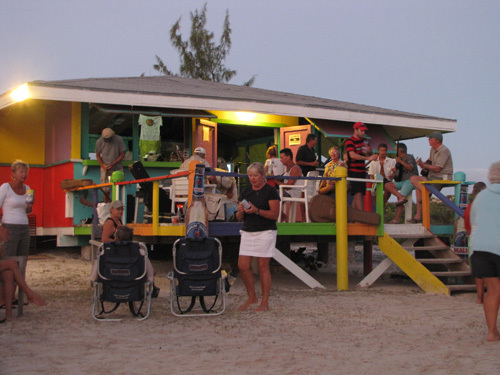 It is not a typical Bahamian store which might be because the couple had lived in the USA. She actually was from Carlisle, not too far from our Lancaster home. 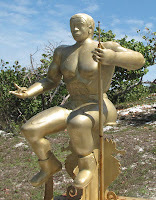 He is Bahamian. They have doubled their ordering in the month it has been open, so we hope it works for them when the cruisers are not so plentiful. But it is a terrific addition to Georgetown. Look up Prime Island Meats & Deli when in town. Al also got propane and I went to get internet at Eddie’s Edgewaters to have faster internet to do the last blog. 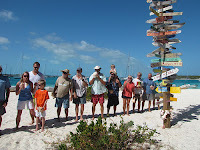 We moved the boat back across the harbor to Monument Beach. Late afternoon we went into Big D’s for a jam session and bonfire. 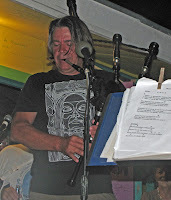 Blair playing the bag pipes. Irene on the left strumming. Our friend, Blair, on Strathspey played the guitar and bagpipes. He was a big hit. When he played, a spectator got up and did a Scottish dance which was great! 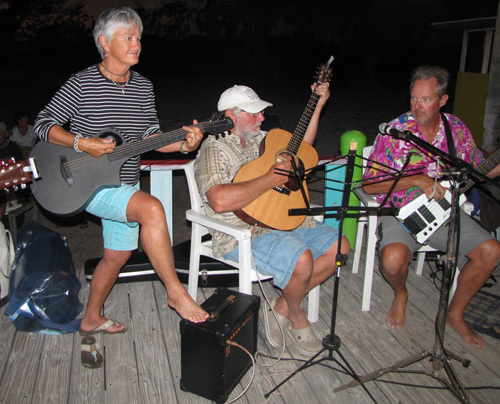 We also had another talented friend, Irene, on Escapaid who strummed along with the rest of the musicians. As they say, a good time was had by all! 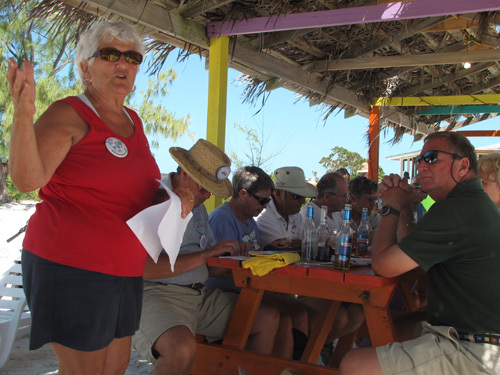 Arleen speaks at "Art on the Beach" about rug hooking. 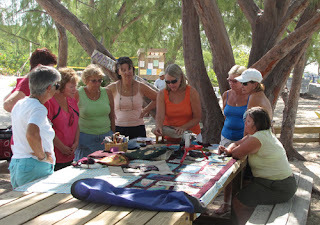 The next day I did a presentation about rug hooking on the beach to a small group of women. It was during the “Art on the Beach” time. After the presentation, men and women came to see my rugs and ask questions. Display of rugs and tools needed for rug hooking. 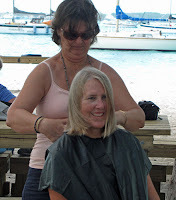 Afterwards, Sandy, from Anania gave me a badly needed trim. We just sat on the beach and let the wind take the hair away. Then since it was Valentines Day, Al, Jim, Irene and I decided to take the dinghy over to Palm Court which is a resort on the other side of the harbor. 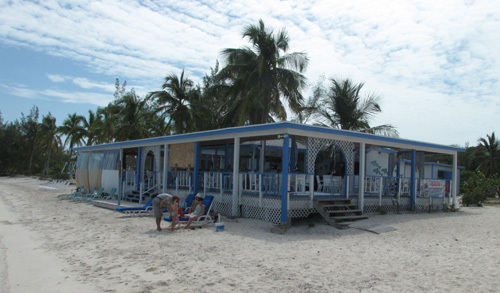 It was a nice place but still had the typical Bahamian food. Take a look at Al’s burger! I don’t know how he got his mouth around it. It wasn’t all meat because there were jalapeños stuffed inside. 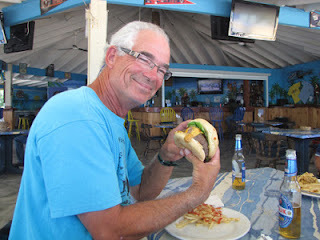 Al ready to enjoy his jalapeno burger! Later that evening we went to Chat n’ Chill for a great Valentine’s Day Dance and danced the night away. Oh what fun, with all those great oldies and line dances. Air conditioned! Not the usual school bus. first time doing this tour and they have much to learn. Like for instance, we don’t just want things pointed out to us, but a little history about it and some facts and figures. 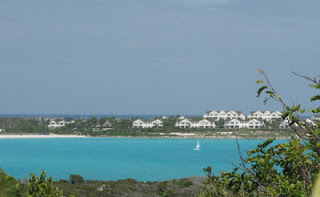 They showed us the all inclusive Sandals resort from afar because no one can get in unless you had reservations. Other than knowing it is the largest employer on the island they did not have any other information. We stopped at a statue of Pompey who was a slave who led a rebellion to do away with slavery in the eighteen hundreds. He was found in Nassau and brought back to the jail which is part of the Pompey Ruins. They actually used this building up to the 1960’s. Irene and Jim show the rest of us how it is done! 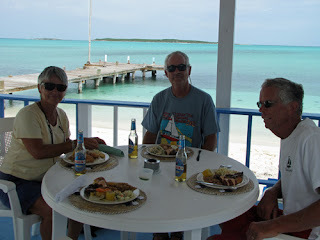 What was lacking in the tour was made up for in the meal served at Exuma Point at Rolleville The meal was the best we have eaten in the Bahamas. It had a lot of the typical foods but also some fresh vegetables and delicious red snapper fish. There was an excellent musician and singer who played for us as Jim and Irene danced to a few songs and they also had some drawings for door prizes as well. 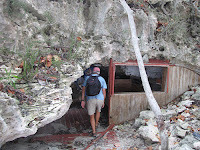 Al heading into the cave. They had a tour to a cave down the beach from the restaurant by the landowner's son. 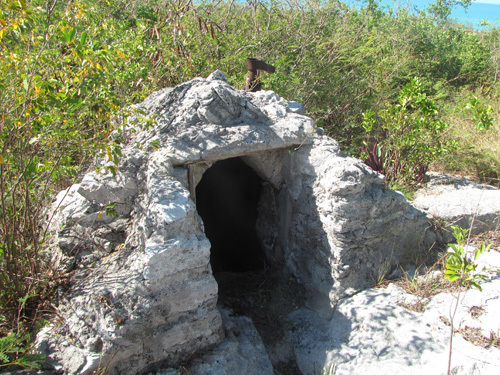 It was a cave right off the beach where an eccentric white man lived for 5 years. He was found walking around George Town naked and so the authorities said he had to leave the area. 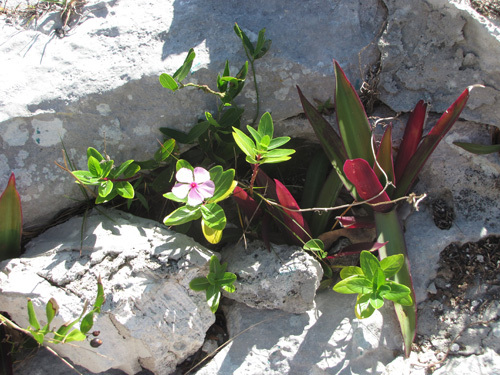 He somehow found the cave and asked the owner of the land if he could live there to which he agreed. He built a wooden bed and covered one of the overhead holes in the cave with plexi glass to keep out rain and other debris. He ate only the vegetables he grew on the land on top of the cave and honey. A photo of the landowner and the eccentric "Cave Man"
Supposedly he had cases of honey stored further back in the cave. As I said, he was eccentric! He left there in 2005 and returned to his wife in the states and died shortly afterwards. He actually was a very wealthy man who just wanted to buck the establishment and live the way he wanted to live. Quite a story! George Clooney on our bus tour! On the way back I asked if I could take a picture of someone on our tour. Take a look ladies. George Clooney? Quite a look a like, but not the real George. He said he has been asked to be a double for him though, does that count? It almost looks like he is smiling! When we got back to the boat the dolphins were visiting the area again. I have to show the one picture I got. I never had gotten one with an eye in it and he looks like he is smiling! We moved across the harbor to ride out the front that moved through that night and was expected to blow for the next few days. We survived the 30 knot winds just fine, but one boat’s dinghy with a 15 horsepower engine came untied and has not been found. That is like losing your car! People have been out searching but with no luck. Phone calls have been made to different businesses to make people aware of the situation. It was blowing 17-20 knots on Sunday so we only went to the beach off of our boat. 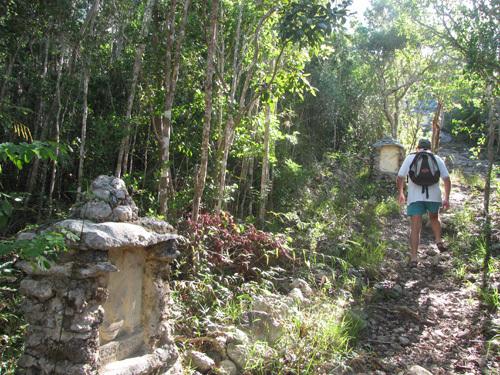 We hiked some trails and were surprised to find one we had never done before called Intrepid. It certainly was a steep one and close to the edge of cliffs. I guess that is why it is called what it is. We spent the rest of the day on the boat due to the high winds. (Since my pocket “point and shoot” camera died, I find my larger camera too big to take on these trails, so unfortunately I don’t have pictures from the hike.) 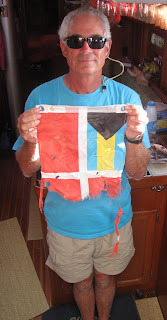 One thing Al did was to remove our Bahamian flag that was a bit tattered from the wind to say the least! That was only up since we arrived in the Bahamas December 12th. 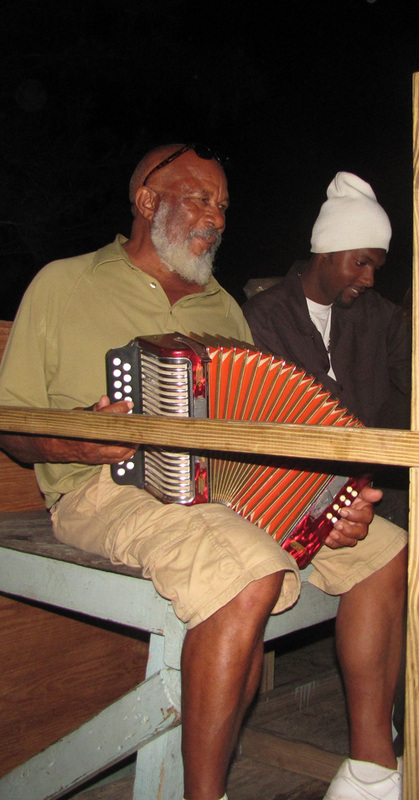 PS If you go to YouTube, and put in George Town Cruisers Conch Oom Pah Band, you might see someone you know. Where did our Bahamian flag go? What a Whale of a Story! 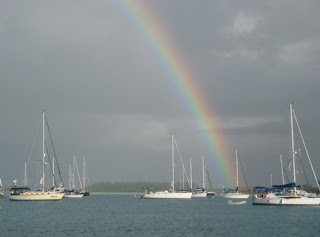 We had decided to stay another day at Conception and I was getting ready to head into the beach and Al says, “Wow, it would be a good day to sail to Cat Island rather than motor tomorrow when the winds are to go light and variable.” I could tell that is what he wanted to do, so we readied the dinghy for travel and took off. It ended up being more of a downwind sail than he expected and the rollers were hitting us on the side which made for a rather roly-poly trip but we did sail. All the way across Al was dragging a lure but had no bites. 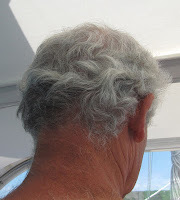 As we neared Cat Island the rollers were less and Al turned to look at his lure dragging in the water when he said, “Wow! What is that in the water? It is huge. At first I could not see what he saw. He pointed right in back of us, and I just saw dark water until all of a sudden I saw a light turquoise spot moving through the water. It was on the underside of an 18-20 ft. whale!!! I saw it surface and could not believe it. 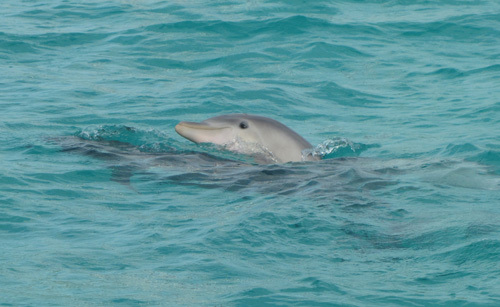 It kept following and crossing back and forth next to and under our boat. It was with us for at least 20 minutes. I kept trying to get a picture but it was fast and all I got were pictures of something dark under the water. Every time it surfaced, I missed the shot. (Dang, those delays on shutters!) 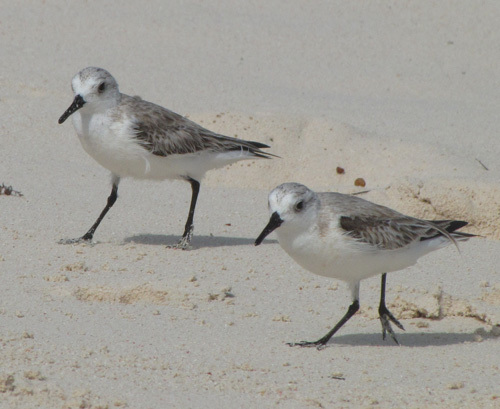 It went under the boat at the aft and then came up with its beak (nose) and breathed several times and rolled 5 ft. from the side of the boat, turned breached one more time further away and then swam off. Al said that the whale had to have red bottom paint on its nose! It was just an unbelievable experience. 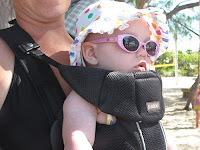 Later that day I checked on the internet for whales in the Bahamas. They mentioned two kinds, sperm whales which are very large and dense beaked whales. 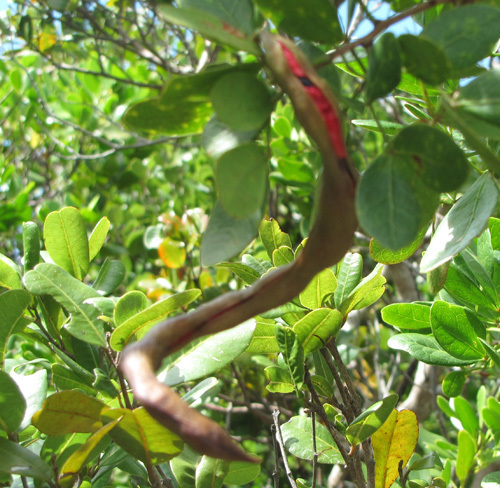 It described it quite well; between 15-20 feet, brownish/blue in color with some white on the underside with a more pointed snout rather than bulbous nose. 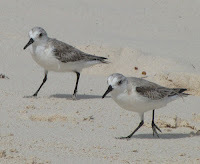 Never heard of this kind but it’s behavior was similar to a dolphin the way it followed the boat. I guess he was bored and just wanted to play. Thank heavens Al didn’t catch that one. He would have had a heck of a time landing it! 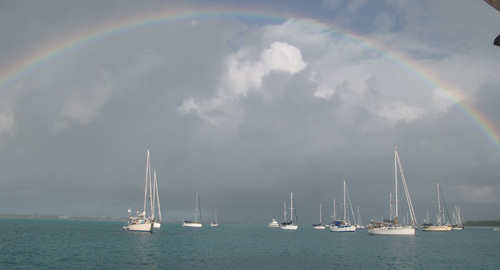 We anchored in New Bight off of Cat Island around 5pm with about 5 other boats. The Hermitage at the highest spot in the Bahamas. After breakfast the next morning we headed into shore to walk to the Hermitage. 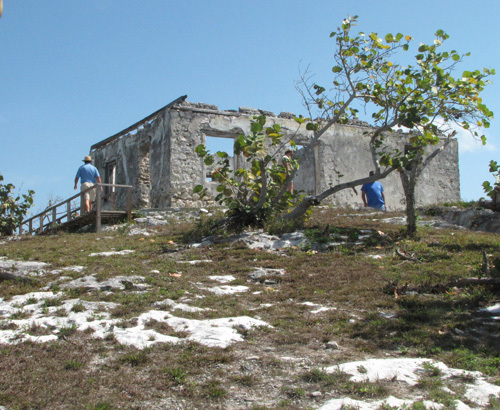 This was Father Jerome’s retirement home built on the highest point in the Bahamas, 206 ft. above sea level. 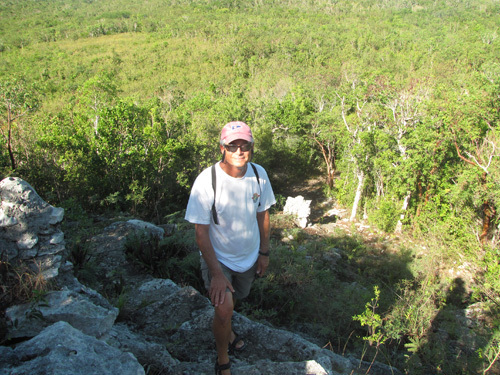 (The Leaf Cay spot we mentioned in a previous blog was the highest spot in the Exumas.) 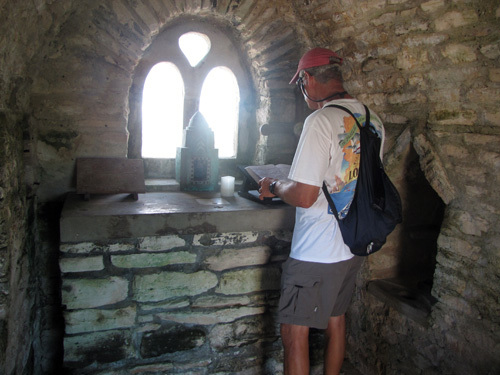 Father Jerome had been an architect and then turned to the priesthood. 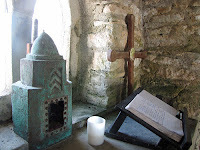 First in the Anglican Church and eventually turned to the Catholic faith. He built two churches on Long Island that we had seen on our last trip. 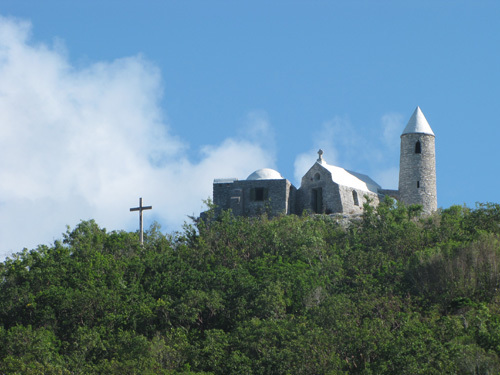 He was known for his knowledge of constructing a church that could survive hurricanes and his missionary work. When we got to shore there were two couples from France who were walking there and so we joined them on a road that leads to the bottom of the hill of the Hermitage. The climb up through the Stations of the Cross. It was not a place for the weak kneed because as you went up through the Stations of the Cross it got quite steep. 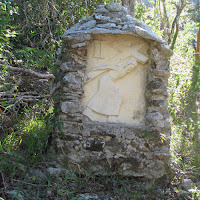 One of the Stations of the Cross. As you climbed you always looked up at the building at the top of the hill because you did not want to turn around to see how high up you were. It was a beautiful spot with a spectacular view. 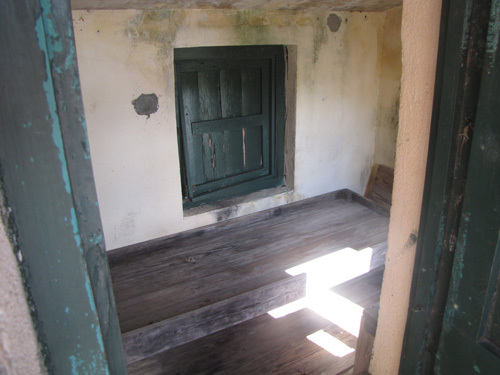 He led a very simplistic life and had minimal living accommodations. He had a small bedroom, kitchen, and chapel. Not much of a bed! The well with hand pump. 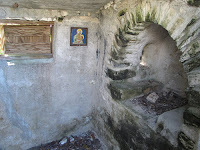 The bake oven with Virgin Mary watching over it. 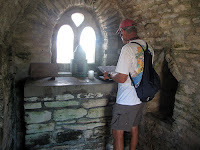 There was a bell tower and his bake oven was in a separate little building away from the house. He even engineered a way to direct rain water to flow down to a well that was dug and had a hand pump attached to get it. 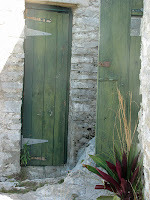 Doors to the chapel and home. 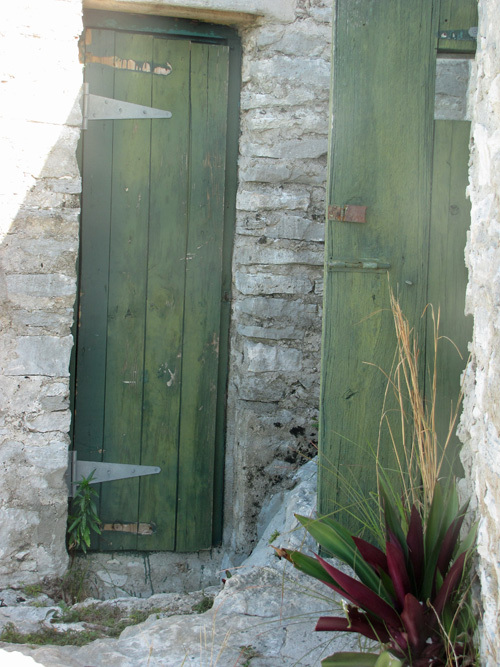 I loved the simplistic doors and the one little impatiens that grew in the crack of the boulders which seemed so out of place in this arid climate but gave me the sense that God was definitely here. 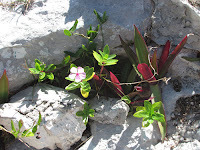 One little impatiens plant in the crevasse. The settlement (town) did not have a lot there. We did find a bakery at a private home and one other small store. There is always the police station and administration office. 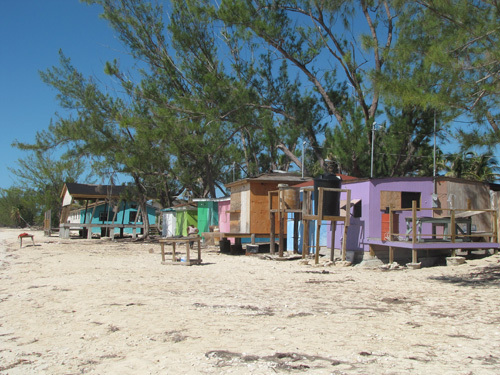 There also were a row of color huts which are for the regatta in August mainly for the Bahamians because of hurricane season most cruisers are not around. 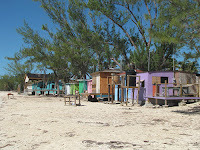 One of the huts was open for business with typical Bahamian menu. We had lunch there and got to know a bit more about the island and its people. 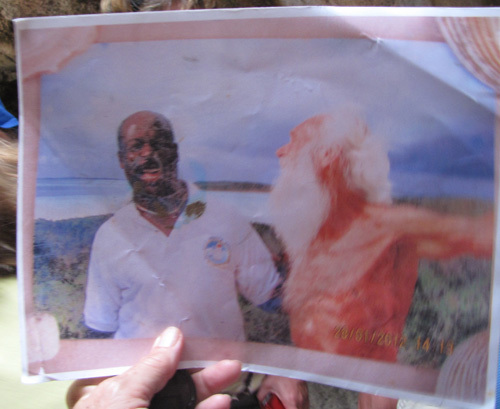 We met an older gent named Pompei Johnson who seemed to be the patriarch of the island. The younger girl who served us lunch was named Seadel and she encouraged us to come in later that night for they were going to do “Rake ‘n Scrape” which is the Bahamian music. 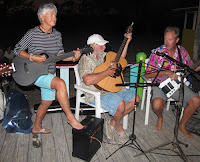 We learned that someone from France came to the Bahamas looking for a group they felt represented this type of music for their musical festival and they picked Pompei, Seadel and one other person. So they got an all expense paid trip to France. We came in to hear this “internationally” known group. Pompei played a small accordion, Seadel played the drum and a young man played the saw. That’s right, a saw, the thing with which you cut wood. He used his hair pick to play but most play it with a screwdriver. Pompei said their music is similar to the type played in the hills of the south. We had a concert played strictly for us and a few Bahamians because none of the other cruisers came in. It started around 8:30pm and that’s too late for most cruisers! Pompei even commented to me that they were going to start earlier for the cruisers the next night. We left the next day to return to Georgetown with Al once again not even getting a bite on his lure. I think fish swam away with all the good ones! 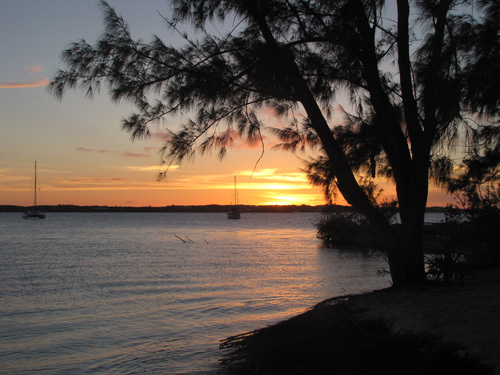 We anchored back at Monument Beach. 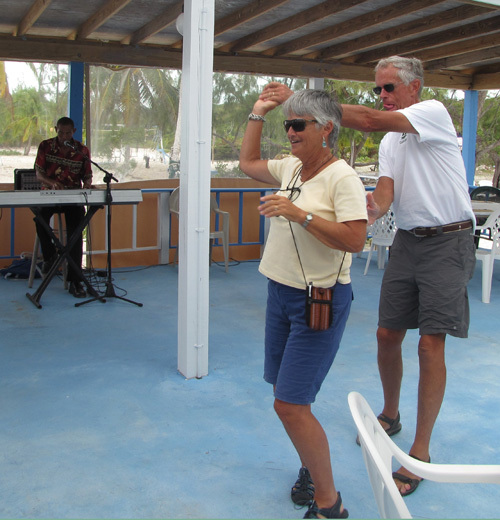 Being Sunday we once again went to Beach Church and there we saw a couple who we met at the Seven Seas Cruising Gam in October which is how we started the trip. It was Dave and Alex from Banyan. Historian who spoke about the Bahamas. 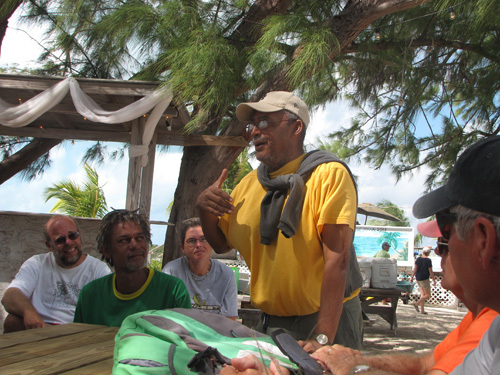 We came back to Volleyball Beach after lunch for a talk given by a Bahamian historian. 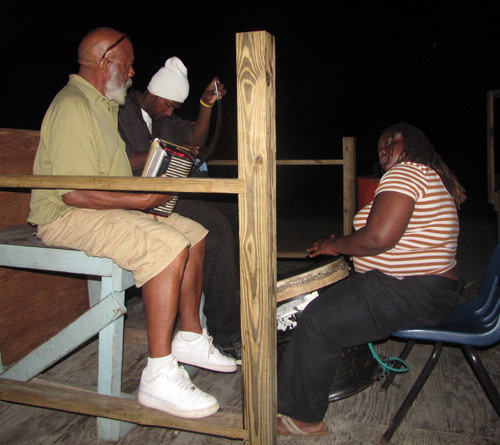 He also brought another Bahamian with him whom added interesting facts and food for thought about the Bahamas. 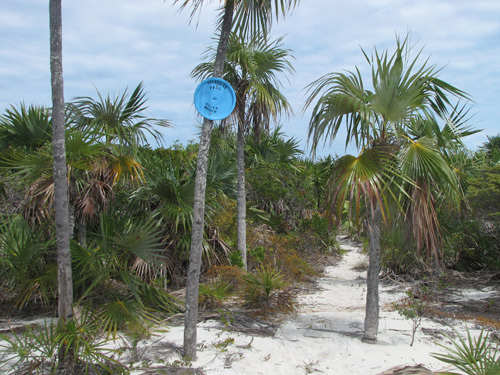 Then we went into Hamburger Beach looking for palm for my baskets and on the way out stopped to visit with Irene and Jim on Escapaid. We ended up staying through Happy Hour, then back to the boat for a restful night. Back to yoga on the beach for me with about 35 other cruisers. 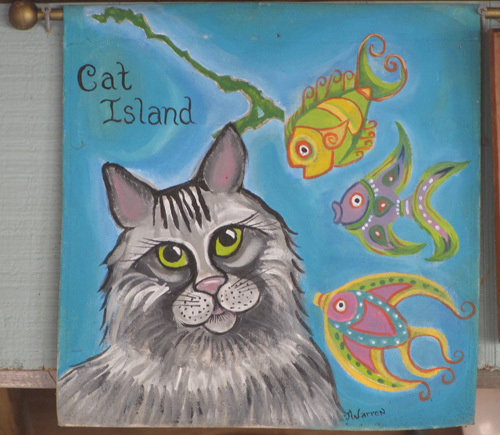 After lunch Dave and Alex came by and we walked the beach down to the Flip Flop Shop to show them this cute spot. 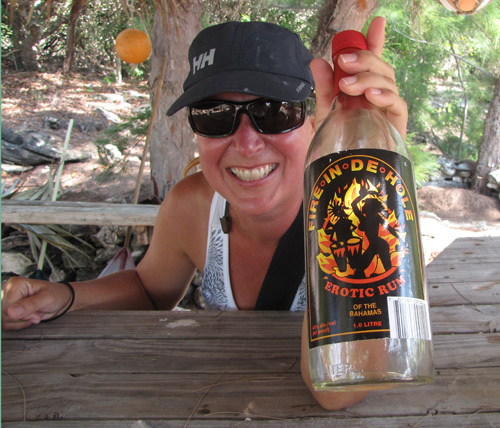 We missed the label on this bottle of rum the last time. From there we hiked the Shoe Trail over to the sound side beach. This was one trail we had not been on before and now I know why they call it Shoe Trail. At 3PM I went to hear another speaker talk on “Safer Choices in a Toxic World.” Interesting but I am not quite ready to give up all plastics and fragrances but I will change some things. Al discussing his conch with fellow cruiser. 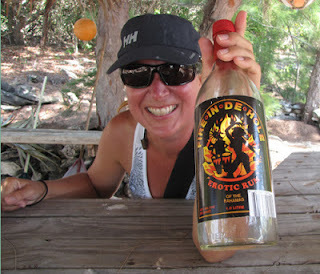 The next day we went over to Volleyball Beach so Al could participate in a Conch Horn Oompah Band. 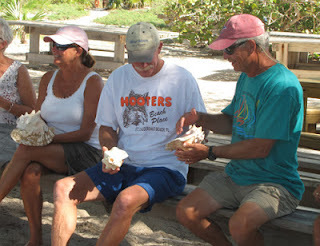 It was hysterical watching all these people practice blowing there conch horns, but even more so when the groups tried do it together. Supposedly they are going to put it on You Tube once it is edited a bit. While doing this, there was a photo shoot with models going on nearby. However, I think this babe was cuter. Guys, she was all of about 14! We had a meet and greet for Seven Seas Cruising Association at Big D’s on Hamburger Beach at lunch time. Later, Mary and Blair on Strathspay and Alex and Dave on Banyan came over for Happy Hour. Both are heading further south. 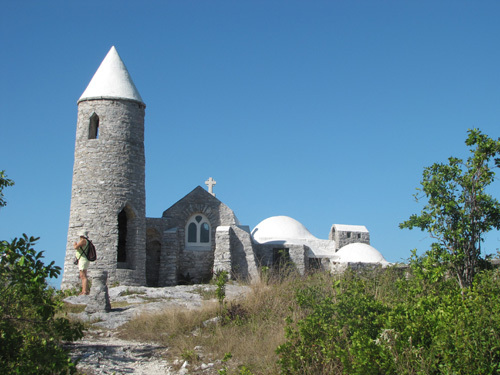 Banyan plans to go to Trinidad and Strathspay to Cuba. Both are couples from Canada. It seems often Canadians are more adventurous than Americans. 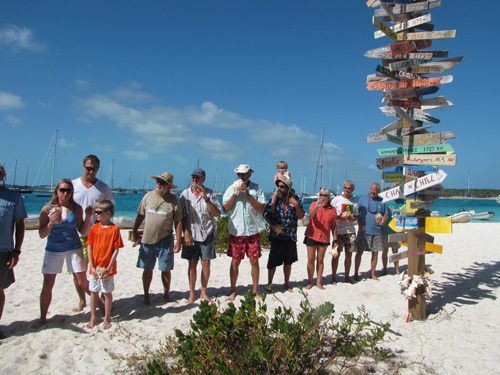 The latest boat count for George Town is 285! Just another beautiful day in paradise! He Can Catch Them, Just Not Land Them!